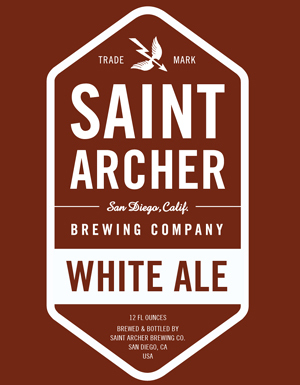 White Ale is the fourth year-round beer from Saint Archer, which opened in 2013. There is a certain celestial-themed beer that walks the Belgian white path and is well known through advertising. That’s a fine introduction to the masses on the style, but those looking to graduate to an ale with more flavor can find it with this one. Here, the vibrant tastes of orange, coriander, pepper and wheat dance together in harmony. With an inviting light golden color and full mouthfeel, this is one can to take outdoors all summer long. Another new-to-me brewery from San Diego, and judging by this beer, another one with a promising future. Suitably sandy-gold in color, this light ale has a gently peppery, coriander-led aroma that is kept a few steps on the fruity side of dry. In the body, it offers a sweetish, orangy front, drier and more herbal, slightly tongue-tingling middle and a drier still, mildly bitter and quenching finish. In other words, it’s just about exactly where a Belgian-inspired wheat beer should be! Just trying it and the review is spot on.